The Moinba ethnic group, with a 2000 population of 8,923, is mainly distributed over the Monyu and Metog areas in the southeastern part of Southwest China's Tibet Autonomous Region. They have their own language, using the Tibetan script, and believe in Tibetan Buddhism. Their main occupations are in agriculture, especially planting rice, with animal husbandry and hunting as supplements. They are good at making wooden bowls and weaving utensils with bamboo and rattan. The Moinbas have long lived together with the Tibetans, who they have established close relationships in terms of marriage, politics, economics, culture, and social customs. Hidden in the high mountain ridges of the Himalayas are many "Havens of Peace" barely known to the world. Monyu, the homeland of the Moinba nationality, is the most beautiful and richly endowed place of them all. Monyu is located at the southern foot of the Himalayas. It is high in the north and low in the south, falling from 4,000 meters above sea level to 1,000 meters. The snow-covered northern mountains form a natural barrier blocking the humid airflow of the Indian Ocean within the valley. Thus, the area has sufficient rainfall, and is neither too hot in summer nor too cold in winter. 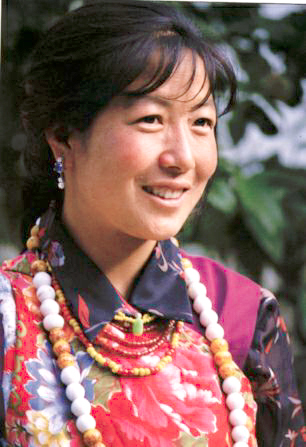 Because the Moinbas share a close relationship with the Tibetans, they gradually moved south to the Monyu area. Hence, Tibetans call them "Moinba" (people living in Monyu). Some of the Moinbas then moved east to today's Metog area and have settled down on both sides of the Yaluzangbu River, creating another residential center of the Moinba ethnic group. Their villages are relatively scattered. Villages of dozens of households are often divided into several residential areas. The structures of their houses are slightly different because of the climate. In the Monyu area, they often build stones walls and sloping roofs covered by planks that are pressed with stone slabs. In their three-story houses, people often live on the second story and keep their grass and stalks upstairs and livestock downstairs. The houses in the Metog area usually rise about one meter above the ground, and also have slanted roofs covered by banana leaves or planks pressed with slabs. All their buildings face east, because they believe a shining sun in the doorway symbolizes good luck and happiness.